SENTRY’s first pistol magazines starts with the GLOCK® Model 17 (17-round standard capacity). Virginia Beach, Va. (July 2018) – SENTRY Products Group, manufacturer of Hexmag magazines, the most advanced and versatile magazine on the market for the AR-15/AR-10 platform, proudly announces the launch of its first pistol magazines for the GLOCK® platform. The design, compatible with GLOCK Gen 3 through Gen 5 models G17, G19, G26 and G34, also accepts current available aftermarket base pad extenders designed for the existing GLOCK 17 magazine. A round counter on the back provides an indicator of capacity while loading to a maximum of 17-rounds. A 10-round version will follow the initial launch for states and areas with capacity restrictions. Additional models are under development to compliment the offering. The design incorporates what users have come to expect from Hexmag: proprietary advanced composites for strength and reliability. The signature HextureÔ finish creates a more secure grip in all environmental conditions. Textured serrations on the front of the magazine body provide for rapid indexing during magazine changes. A self-lubricating anti-tilt follower allows for ease of loading and flawless operation. A heat treated stainless-steel spring offers a lifetime of trouble free performance. 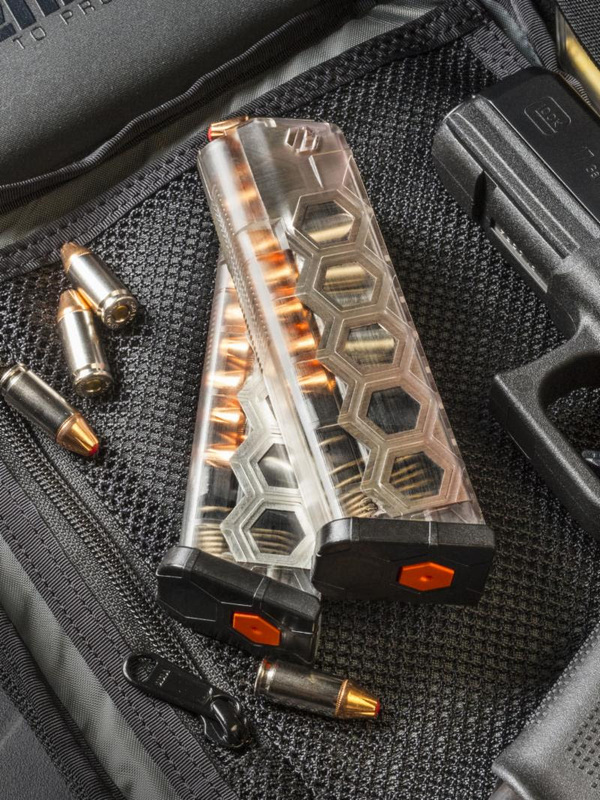 The new Hexmag GLOCK also features Hexmag’s tool-less takedown and HexIDcolor identification system, increasing safe operation and personalization. SENTRY has partnered with Amchar Wholesale and Midway USA for initial product distribution and all orders can be secured through these outlets. Consumers can also order direct at HexmagStore.com.